The Schoenstatt Rosary Campaign is an outreach or apostolate within the Movement. It initiates prayer, evangelization, and formation through the traveling pilgrim MTA shrine. 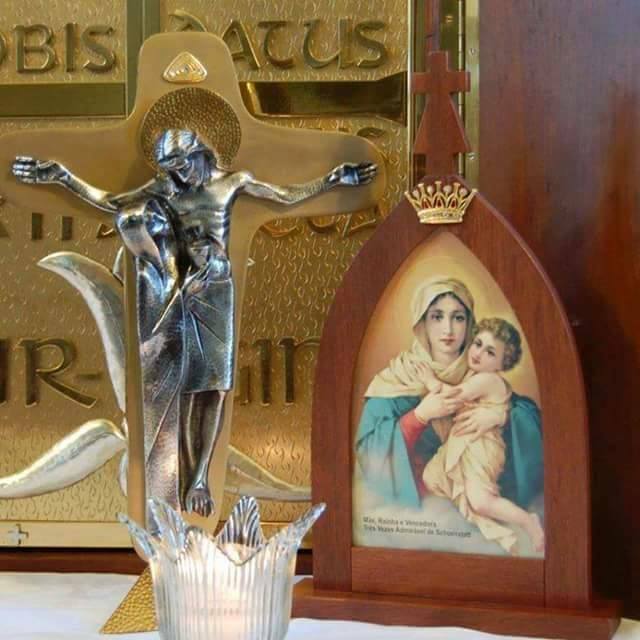 The rosary campaign began in 1950 when Deacon John Pozzobon, a member of the Schoenstatt Movement in Santa Maria, Brazil, received a picture of the Mother Thrice Admirable. It was suggested to him that he take this MTA picture into the homes of many people. He accepted this idea as a holy task and special mission. For 35 years Pozzobon took the MTA on pilgrimage in Southern Brazil. He walked a total of more than 87,000 miles and brought the picture of our Lady of Schoenstatt to a different family each day. The SRC started in Texas in 1987. Each year, new missionaries are entrusted with a pilgrim image and form groups of 7 to 10 families and/or individuals who will welcome the pilgrim MTA shrine into their homes. When Mary visits our home, schools, parishes or work places she wants to serve our needs and intercede for miracles of inner transformation in our lives. She knows that we cannot travel easily to the great pilgrimage places in Lourdes, Fatima, Guadalupe or Schoenstatt in Germany. Therefore her motherly concern for us and her devotion to Christ urge her to come to us through the Schoenstatt Rosary Campaign. Contact the Rosary Campaign leader for more information on becoming a missionaries and starting a group or to learn how to join an existing group. "She is the Great Missionary. She will work Miracles."